It’s been great spending time with RSPB members at The RSPB Weekend held at the University of Nottingham over the last three days. With it being the magic month of April with lots of bird activity and incoming migrants, it was also pretty good for bird sightings and many people went home with some nice species marked in their notebooks - me included. Those who joined me and my fellow guides on the early morning bird walk were treated to a lovely dawn chorus on Saturday and a pair of peregrines on a tall tower were a big surprise – I certainly wasn’t expecting them anyway. There are some species here in the UK where certain times of the year make a big difference to your chances of seeing them. 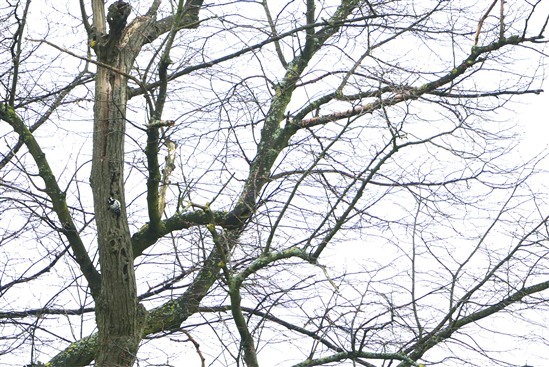 One of these is lesser spotted woodpecker. In March and April, they are more vocal, drumming and generally easier to detect as they think about breeding. Wollaton Park, just over the road from the university is, I learned last year, a hotspot for them, so with our photographic workshop being held there and lots of memebrs asking me what they could see around campus, I took the opportunity to do some staking out between all my other duties. Plenty of exotica in the form of mandarin ducks, ring-necked parakeets, Egyptian geese and a male ruddy shelduck were certainly eye-catching, but I was very pleased to see three different male lesser spotted woodpeckers – a species I’ve been struggling to find near me this year. The first gave its piercing call which led me to it in a block of trees by the lake. I soon had it pinned down in the treetops and it flew close to pose nicely for a while. The second was excavating next holes in a birch tree and gave brilliant eye levels views for several minutes. The third was making its longer, more rattling "drumming" than the shorter, fading away equivalent of the great spotted throughout my visit and gave very good views on the golf course, then in a big old oak tree near to the day roosting site of a gorgeous tawny owl. The park is famed for its deer and as RSPB Picture Researcher and RSPB Images guru, Ben demonstrates below, you can get good views of red and fallow deer here. They’ve been here for 500 years or more apparently. The message I really took away from all this great wildlife in a city was that you can find lots of great wildlife close to large numbers of people and we can co-exist happily. It was also good to see plenty of dead wood in the park - no doubt one of the main reasons for so many woodpeckers, nuthatches and lots of hole-nesting jackdaws. The north-east wind and rain made yesterday, when we traveled back, a good day for grounding migrants and lots of common scoters had been found resting on inland reservoirs and gravel pits. I got back in time to take in a flock of six at my local patch, five minutes from home, of Grafham Water and then a pair at close range at Paxton Pits, another of my local hangouts.